THEY HAUL ON LINES, HOIST DINOSAILS. AND SCALE THE RIGGING WITH THEIR TAILS. When landlubber dinos lumber into their sloop, they take to the bounding main like old salts. “HEAVE HO! HEAVE HO! THIS LIFE'S FOR ME! 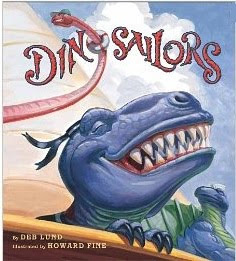 It’s a giddy trip for the sailorsaurs in Deb Lund’s and Howard Fine’s handy new board-bound edition of Dinosailors (board book) Houghton Mifflin, 2011), with a their doughty dino crew, a mixed mob of T. Rex, tricerotops, diplodocus, and hadrosaur, roaring out sea chanteys and besting the swells with lusty gusto, until–YAAARRRRRGGGG!–a squall strikes. The bounding main is bounding a bit too much for the dining dinos in the galley, who find themselves making a quick trip to the railings. No more heave hos, just plenty of plain old heaves as they hurl their hardtack over the side. And, so it seems, their little ship can't stay up either! It's soon awash, and their seafaring adventure is a wash! The crew comes to a quick decision. It’s u-dino-mous! No more soggy sailing for these saurians!They'll seek alternative transportation. There's gotta be a better way to go! And as the sopping saurians board a train for home, it's surely a cue for a locomotive sequel. There’s plenty of nautical terms here, almost worthy of a seagoing glossary, which author Lund works into her meter without a single trip of her trochaic (or iambic) feet. And with Lund’s lively couplets and Howard Fine’s merry mob of happy hadrosaurs. dancing dimetrodons and dizzy diploducuses, any journey they take is going to be a real trip! Deb Lund will be on blog tour this month. If you would like to interview her, email me.